Lift and Accessibility Solutions has become a leader in providing solutions to small businesses needing to meet the ADA requirements for accessibility in their restaurants, shops and offices. Platform Lifts are also referred to as wheelchair lifts, vertical lifts, vertical platform lifts, or inclined platform/wheelchair lifts. They provide a cost-effective alternative to elevators, allowing wheelchair access to higher or lower levels without having to use a ramp. 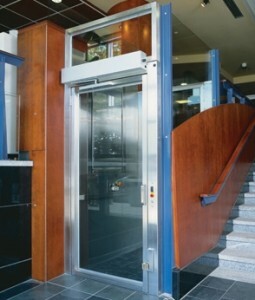 The biggest differences between an elevator and platform lift is that the car is usually open and it takes constant pressure on the control button to operate. 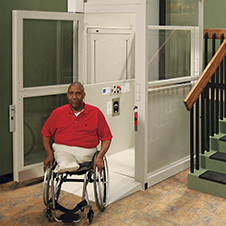 Platform or wheelchair lifts can be vertical (straight up and down) or incline (move up and down existing stairs), be installed at both indoor and outdoor locations, can travel from 7” up to 12 feet between floors, can have single side, straight thru or ninety degree flow patterns with different design rules for each configuration. The size and location of the lift, its landing areas, door swings and placement of the call/send controls at each floor all need to be well thought out to meet all ADA requirements while keeping costs to a minimum. If you need to make a church, school, office or other public building accessible for people with limited mobility, consider calling us to schedule a phone consultation and/or site visit with our elevator contractor who has the knowledge and expertise to properly advise you in the requirements needed and can help you choose the right product for your public building.